Another month has flown by with our precious Bennett!! Two months old and just as loveable as ever. Here are his two month stats. Sleep: We've finally gotten into a good, solid bedtime routine. Bennett is all set and ready for bed by 8:00. He has a dreamfeed at 11:00 then sleeps until at least 3:00, sometimes 3:30. He's up at 7:00 the next morning. Bennett takes five naps a day and they last between 1.5-2 hours. He sleeps in his crib, swaddled with one arm out. I lay Bennett down sleepy but awake. If he wakes up halfway into his nap, he quickly puts himself back to sleep. 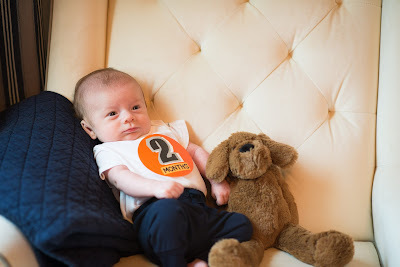 We started healthy sleep habits from the very beginning with this little one and I am SO glad I did that because getting him down to sleep is a piece of cake. No sleep props (aka paci, rocking, bouncing) needed for Bennett!! Eat: I'm still exclusively breastfeeding Bennett and he nurses 8 times a day. He's quick! It takes him no longer than 9 minutes to eat. Clothes: Newborn clothes fit him perfectly now. I've put him in some 0-3 month clothes and they don't completely swallow him! He's still in his preemie and newborn Kickee Pants although I should probably stop putting him in the preemies because his toes are at the very edge but it's always SO hard for me to let go of those first set of pajamas!! Likes: Being outside, looking around, baths, cuddles, milk. Dislikes: Clothes going over his head, when his brothers kisses are just a little too rough. 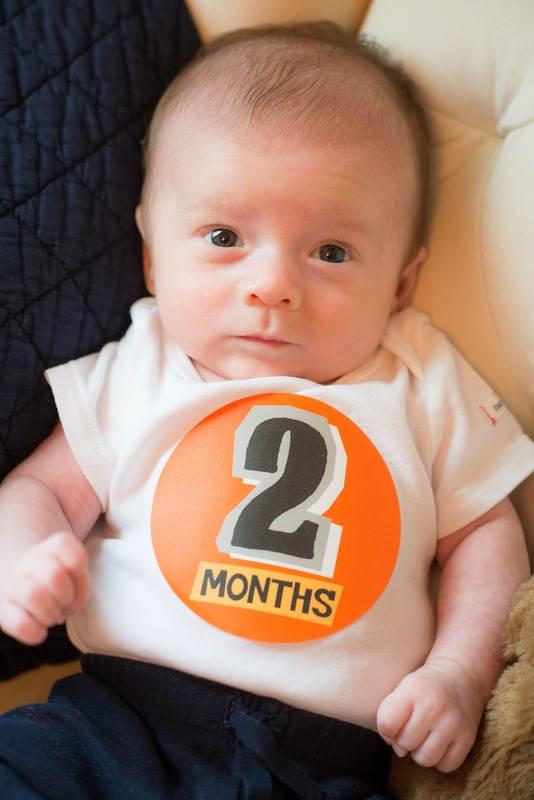 Milestones: Bennett is starting to coo now! Sweetest little noises ever!!! Month Two: Bennett has had another wonderful month! He's still just a chill little guy and he's starting to become a really good sleeper! All About Bennett: What a sweetie! I can't even handle how precious Bennett is. His wake times are only about an hour at a time but during that time he is just adorable! If I'm not able to hold him while he's awake, I put him in his bouncer or rock n play then stick him in front of something interesting for him to stare at! He loves to just look around. We are just so in love with this sweet boy and I bet I kiss his cheeks 100 times a day! And every time I do, he opens his mouth wide like he wants more! We are so lucky to say he's ours!! Do you mind telling your schedule? Wake time? 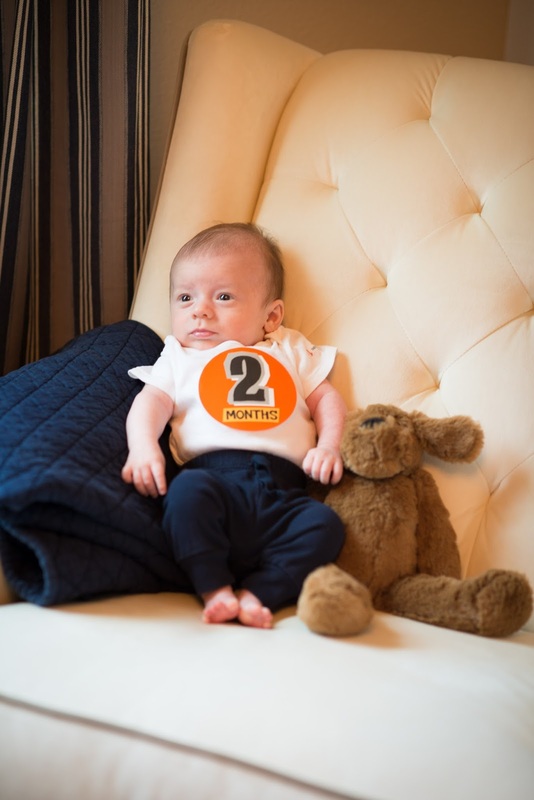 I had my son 7 weeks ago and he's #3 and I'm dying on lack of sleep. He sleeps awful and naps are about nonexistent. I followed baby wise won't my girls and they did it wonderfully and he isn't AT ALL. Hey!! I'm sorry! Ugh no sleep is awful!!!! 6:00-6:30 eat, wake, bath, bedtime routine...up for 2 hours. 3:00(ish) middle of the night. There's a group on FB called Babywise Mamas. You should join! You'll get a lot of helpful advice on there. Let me know if you have any other questions! I'm happy to answer them!! Thank you so much!! He's thrown me for a loop not being a better sleeper and it's wearing me out, especially having 2 others to take care of. Throw in reflux and not gaining and it's just been a fun few weeks. My 7 yo has witnessed me cry more times and keeps apologizing to me how hard 3 kids is and has offered to be up in the night with him, bless her!! We did chiropractor after his lip and tongue tie revisions but I'd be willing to keep going if it will help. She said he was in great alignment so we didn't continue on afterwards. Also I promise I'm not some random person :) I'm from AR and my husband and I both went to U of A and I somehow came across your blog years ago thru mutual friends. We're now in Houston for his work but so want to come back to NWA.